Grant McCann says he is fed up of having a go at his Posh players for their slow starts to matches. The Posh boss spoke to his players shortly after his side’s 3-1 loss to Swansea to find out why they are struggling to assert themselves on the opposition straight from kick-off, barring the notable exception of the 5-1 win over Millwall where they scored three times inside 20 minutes. McCann admitted Posh had shown the Premier League side too much respect during the first-half of their EFL Cup second round tie tonight (Tuesday, August 23) which saw Swansea take a 3-0 lead going into the break. Debutant Ollie McBurnie struck twice just before half-time after Jay Fulton had given the visitors the lead. 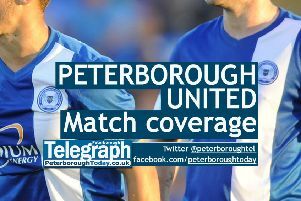 Posh goalkeeper Mark Tyler, who filled in for the injured Ben Alnwick, was also called on to make a number of saves. McCann said: “I thought we gave them way too much respect in the first-half. We spoke before the game about getting after them. “We’re at home, it’s London Road and we want to get about them, we want to get the fans off their seats and we didn’t. “From minute one they kicked off and kept the ball for about 30 passes which was frustrating, and it just set the tone for the game. “To be honest, at half-time I was a little bit worried. I said, ‘if this continues it could be six or seven’. “But it took a few nasty words at half-time for them to react again. We can’t keep doing it, I can’t keep having to have a little pop at them for them to react. The highlight of the match for Posh was 17-year-old Leo Da Silva Lopes’ first goal for the club, a 25-yard screamer after he had won the ball. McCann said: “Leo did what I wanted the midfielders to do in the game. He’s broken them up and he’s had a great shot. McCann stated that centre-half Ryan Tafazolli is due to be out for another week with a hamstring tear, but he will have Jack Baldwin back from suspension for Saturday’s trip to MK Dons. And he will hope to have Alnwick back in goal after the goalkeeper pulled up in the warm-up. An assessment will be carried out tomorrow. McCann added: “It’s frustrating. I didn’t know he had felt his hamstring yesterday, apparently in training, Jon the physio tells me. “He said he told Jon yesterday which I didn’t know. But he’s obviously kicked the ball in the warm-up and felt it again.